Michael Carter Tate was born in Sydney, New South Wales, on 6 July 1945, eldest child of William Arthur Tate and his wife Wilma Ellen, née Carter. His father was originally from Tasmania, and after eleven years in Western Australia and New South Wales, was transferred back to Tasmania as an accountant with the Caltex oil company, and the family settled in Hobart. Michael Tate grew up in 'a very warm, caring Catholic household'. His parents supported the Liberal Party and his father was president of the Sandy Bay branch. By his own admission having voted Liberal when he was first eligible to vote, if circumstances had not pushed him towards the political left, he probably would have grown up to be a staunchly conservative Catholic. Tate attended St Virgil's College, a Christian Brothers school in Hobart, where the teaching of Latin provided him with 'a structure to language'. While appreciating the education provided by St Virgil's, Tate remembered how Catholicism of the 1950s gave 'the sense of being surrounded by angels and always being in peril of mortal sin'. After secondary school, he won a Commonwealth Scholarship and enrolled in law at the University of Tasmania in 1963. He had considered studying for the priesthood, but was reluctant to lose the close contact with his family that this would have entailed. That October a horrendous and life-changing car accident put him in hospital for months. Despite suffering prolonged ill-effects from the accident, physical and psychological, Tate graduated as a Bachelor of Laws with first-class honours in 1968. Tate was awarded an international Commonwealth Scholarship which he used to study at Oxford University (1968–71), acquiring a Master of Arts in theology, after having taught himself ancient Greek to allow him to read original sources. Tate's New Testament studies enriched his religious sense, and he found himself 'altogether in tune with the broadening of Catholic thought' associated with the Second Vatican Council (1962–65). His studies invoked a commitment to Christian pacifism, changing his views on the merits of the Vietnam War and leading him to draw a life-long inspiration from Martin Luther King. His new-found sympathy with the political left also had a secular catalyst: medical treatment was free under Britain's National Health Service, allowing him to undergo surgery to resolve medical issues resulting from the 1963 accident, whereas, in Hobart, the cost of medical treatment had put a great deal of financial strain on the Tate family. In 1972 he joined the law faculty at the University of Tasmania, lecturing in constitutional law over the next six years and being appointed Dean of the faculty in 1977. Journalist and student, Martin Flanagan, recalled his 'extraordinary devotion to duty', maintaining rigorous intellectual standards but also engaging with students 'more than any other member of staff'. Yet Tate still found time for broader concerns. His animus against the Vietnam War, especially the resulting conscription of young Australians (including some of his students), led him to join the ALP. From 1972 until 1975 Tate was a member of the Catholic Commission for Justice and Peace, which issued annual statements on topical social issues, and served as legal adviser to the Tasmanian parliamentary delegations to the Australian Constitutional Conventions held between 1973 and 1977. In 1976 Tate became a Labor candidate for the Senate. He had originally been selected in fourth position on the ticket, but over the next year the unexpected withdrawal of two candidates above him moved him to second place. Despite the Coalition's comprehensive election victory on 10 December 1977, Tate's position on the ticket ensured his election. On his entry into the Senate, this committed Christian surprised many by choosing to make an affirmation, rather than swearing an oath. He considered that the treating of an oath as a guarantor of truth demeaned both oath and oath-taker. During the Vietnam War Tate had been troubled by the government's 'rigid' application of conscription, and in his first speech to the Senate on 23 August 1978 he drew attention to what he saw as one of 'the most disturbing features of our statute book': while the National Service Act 1971 protected the right of 'the total pacifist' not to engage in military service, 'the ordinary person', whose conscience distinguished between the just and the unjust war, had no such protection. This was an issue which Tate pursued vigorously. In 1983 he introduced a private senator's bill to amend the National Service Act, so as to allow for conscientious objection to participation in particular military conflicts. Over the next two years the measure was considered by the Senate Standing Committee on Constitutional and Legal Affairs which Tate chaired (1983–87). The committee made a unanimous recommendation that 'specific conscientious belief' should be recognised as a ground for exemption from military service in the same manner as 'absolute conscientious belief'. Over the next year Tate asked questions in the Senate, querying the delay in response to the recommendation by his own party in government. In December 1986 the Hawke Government announced that it had accepted the report's major recommendations. However, no further action was taken until the Keating Government's Defence Legislation Amendment Bill, which included provision for particular conscientious beliefs, passed through Parliament in 1992. Tate pronounced the legislation to be 'a most satisfying conclusion' that ensured 'the integrity of the individual is paramount against the coercive power of the state'. He also considered that the bill fulfilled 'a fundamental promise' that he had made 'to all those who were so gravely affected by the harsh application of the conscription laws'. Tate found the change from the busy prestige of his academic life to five years of being a 'nonentity' as a novice Opposition senator 'extremely frustrating and depressing', but he still managed to make an impression in his first Senate term. He chaired the Scrutiny of Bills Committee (1983–87) and was a member of a number of other Senate and joint committees. He used Senate debates to argue that the country 'should cut the nexus between Australia and the Crown', and he was unsparing in attacking wealthy tax-avoiding 'bludgers' who, by increasing the burden on ordinary taxpayers, were 'the real subversives in our society'. He also won notice for proposing that the personal use of marijuana be decriminalised, arguing that the drug should be dispensed in chemists. He emphasised 'the hypocrisy which confers honours on the brewery barons and tobacco tycoons, while condemning marijuana use'. Tate spoke forcefully on a number of international issues. In 1980 he deplored Australian recognition of the 'monstrous and barbaric' Pol Pot regime in Kampuchea. In 1984 he described the murder trial in the Philippines of an Australian priest, Father Brian Gore, and several others, as an 'intolerable outrage', instigated by 'corrupt officials'. Although the case was dropped after international protests, Tate later told the Senate of 'brutal retributions' carried out by 'military and paramilitary groups' allied to the government of Ferdinand Marcos. While condemning unequivocally the Soviet invasion of Afghanistan in February 1980, Tate was angered by the 'contradictory, divisive' response of the Fraser Government. He described the government's emphasis on a proposed boycott of the Moscow Olympics as the 'singling out of our athletes for discrimination', pointing out that Australia was continuing to trade with the USSR, including in weapons and the strategic metal, rutile. Although he was an admirer of Labor leader Bill Hayden, after Hayden had agreed to step down as party leader Tate publicly supported Bob Hawke's succession in February 1983, later describing it as the 'hardest decision' of his political career. In the following month Tasmanian factionalism, unrelated to the federal leadership struggle, saw Tate dropped to fourth place on the Tasmanian ALP's Senate provisional pre-selection list. Only federal intervention returned him to the second place on the state ticket, assuring his re-election. Seven months after the Hawke Government had come to power, Tate organised the prime minister's visit to the West Coast of Tasmania, where there was a strong local antipathy to the government's decision to block the construction of the Gordon-below-Franklin dam. Advisers feared that Hawke might be subjected to 'murderous attacks', but there was no violence with Tate describing the visit as a 'remarkable event'. In March 1984 Tate was appointed chairman of the Select Committee on the Conduct of a Judge, which examined the conduct of former High Court Justice and senator Lionel Murphy in relation to the so-called 'Age tapes'. The committee reported in August 1984: the three Labor members found that there was no prima facie evidence to prove an allegation that Murphy had perverted the course of justice by seeking to influence a criminal case involving a friend; the non-Labor trio took the opposite view. However, Tate did accept that, on the balance of probabilities, Murphy's conduct could have amounted to misbehaviour. The following month Tate was appointed as chairman of a second committee, the Select Committee on Allegations Concerning a Judge, which was charged with investigating a separate allegation that arose in the first inquiry. This time Tate joined the non-Labor members and declared that Murphy had a case to answer. Although the recommendations had solid grounding, they attracted much odium from within the ALP. Although Tate always remained loyal to the Labor Party he remained very much his own man, albeit within the limits of Caucus solidarity. Shortly after the December 1984 election, Tate led a Caucus push for closer liaison between the party leadership and Caucus committees (Tate chaired the Caucus legal committee); and within Caucus he was a severe critic of the Hawke Government's decision to sell uranium to France. In the Senate Tate expressed 'very grave misgivings' over legislation deregistering the Builders Laborers' Federation and, although voting for the bill, he suggested that the measure would threaten freedom of association in a manner that echoed the attempt to ban the Communist Party in 1952. In 1985 Tasmanian Independent senator, Brian Harradine, put forward a bill with the aim of ensuring that human embryos created by in vitro fertilisation be used only for the purpose of implantation in the womb, prohibiting any experimentation inconsistent with that purpose. During debate on whether the bill should be referred to a select committee for inquiry and report, Tate stated: 'there is something inherently improper about the medical manipulation of non-consenting human life where the end and object in view is not the enhancement of that life'. The bill was referred and Tate accepted the demanding role as chairman of the Select Committee on the Human Embryo Experimentation Bill. Tate drafted the majority report, signed by five of the seven committee members, noting that the committee's report was the first by a parliamentary committee in the English-speaking world to deal with issues created by human embryo research. The majority report endorsed the distinction made by the World Medical Association's Helsinki declaration between approved therapeutic experimentation and prohibited 'destructive non-therapeutic experimentation', while recognising that 'this distinction, whilst simply stated, may not be so easily determined in practice'. In the end, the views expressed in the committee's majority report were not too different to the position taken by the Catholic Church. Tate's dedication to the Catholic faith was always apparent in his parliamentary work. For example, as president of the Parliamentary Christian Fellowship (1985–88), he ensured that there was a religious observance at the opening of new Parliament House, concluding with an ecumenical service. In 1987 Tate again faced pre-selection difficulties in the run-up to the next election, due to continued resentment over his role in the second Murphy inquiry and state factional conflicts. Once more survival came only after intervention from afar, with Hawke acting directly on Tate's behalf. 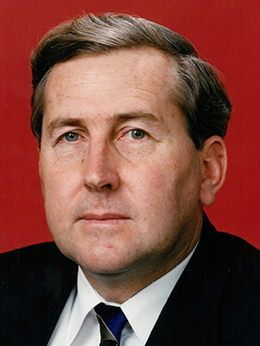 More was at stake on this occasion as Tasmania's only federal Minister, Senator Don Grimes, had resigned from the ministry in February 1987, creating an opportunity for another Tasmanian to advance. Tate was elected to the ministry by Caucus and became Special Minister of State. He headed the party's Senate ticket at the double dissolution election held in July, but directly after his re-election, the Centre Left faction decided to remove their backing for Tate as a ministerial candidate. Tate remained in the ministry only after Hawke had insisted that 'Tate has to be reinstated'. Each of his ministerial roles were of a similar nature even if he held different titles—first as Parliamentary Secretary for Justice, and then, from September 1987, as the inaugural Minister for Justice, under the aegis of the Attorney-General, in an expanded Hawke Ministry. In his ministerial capacity, Tate looked to implement measures against organised crime, the drug trade, money laundering and tax evasion. He facilitated the passing of legislation to provide for the confiscation of the proceeds of crime, and for the reporting by financial institutions of large or suspect transactions. In 1988 he initiated a restructuring of the Australian Federal Police (AFP) and, in 1990, he announced a change in emphasis for the work of the National Crime Authority (NCA) towards investigating white-collar crime, moving it away from investigations into drug-trafficking. He supported enhanced investigative powers, including phone tapping, for both the AFP and the NCA and he enhanced the extent to which the AFP could deploy personnel overseas. Noting that his work had strengthened national law enforcement organisations and powers, he accepted that he had shifted the balance away from civil liberty towards the imperatives of enforcement. Later, in 1990, when discussing death threats to the family of the NSW Independent MP, John Hatton, Tate showed emotion in telling the Senate that he had also received death threats as a result of his work against organised crime. In 1987 Tate played a key role in establishing the Royal Commission on Aboriginal Deaths in Custody and, following the Hoddle and Queen Street mass shootings in Melbourne, in initiating a national review of gun control laws. The Melbourne killings were also a catalyst to set up a high-powered National Committee on Violence. Violence was an issue that Tate prioritised, especially when it took the form of domestic violence. Tate believed that the sentences served by convicted criminals should approximate the sentences handed down, without the automatic remissions available under state penal systems and, in 1990, to 'impose certainty in sentencing', he moved to deny state remissions to prisoners convicted under federal laws. On 24 March 1990 the ALP won its fourth term of office. In the new ministry Tate added the Consumer Affairs portfolio to his responsibilities. Weeks later, at a press conference, he enthused over the arrest in Bangkok of an alleged drug baron, describing the man as Australia's 'No. 1 importer of heroin'. Unknown to Tate, the arrested man's sister was being tried in Sydney on drug importation charges, and his 'ill-advised' public remarks resulted in the trial being aborted. Reportedly, Hawke stated 'Frankly we are appalled at the lapse in judgment' and gave serious consideration to sacking him, before deciding that he should remain due to his 'excellent record' as a minister. This did not save Tate from being censured by the Senate in May 1990 'for failing to meet the required standards in the conduct of his office as a senior law officer of the Crown'. In January 1991 Tate was tormented by Hawke's decision to commit Australian forces to the first Gulf War. For five days he weighed up his Christian pacifist beliefs against the concept of a just war, deciding that the conduct of the Iraqi dictator, Saddam Hussein, justified international military action. Having made his decision, he removed the portrait of Martin Luther King that had hung in his office, later recalling: 'my heart broke because I was going against what really led me into politics'. Despite Hawke's decision to commit troops to the Gulf War, Tate remained a Hawke supporter when Paul Keating made his first leadership challenge in June 1991. However, by the time of Keating's second and successful challenge, Tate had changed his mind, believing that Hawke had 'exhausted his capacity' to inspire voters with a Labor vision for Australia. Keating's succession in December 1991 saw no immediate change to Tate's role. Under his authority, the Trade Practices Amendment Bill (No. 2) was introduced, establishing that producers of defective products would be legally liable for any damage or injury that may arise from the use of the products. However, opposition from business and from within Caucus meant that the final measure was markedly less stringent than that which Tate had first proposed. He also oversaw changes to bankruptcy laws and privacy legislation. Although he shed the consumer affairs portfolio in May 1992, he retained the justice ministry and was appointed as the Minister Assisting the Minister for Immigration, Local Government and Ethnic Affairs. In October 1992 Tate took great umbrage at the landmark High Court judgment which struck down a federal law banning paid electronic advertising during election campaigns on the ground that the law would violate an implied constitutional right of free speech. He commented that it was 'breathtaking' and 'absolute nonsense' that the judgment looked to the common law for authority. He argued that representative government was 'essential to our form of democracy' and that statute, not common law, was the only legitimate means to protect the 'rights and liberties of the Australian people'. In his capacity as Minister for Justice Tate was prominent in the drafting of a new oath of allegiance, writing the first draft which received its final shaping in the Prime Minister's Office and was given legislative form through the enactment of the Australian Citizenship Amendment Act 1993. The new oath removed any reference to the monarch; instead there was a pledge of 'loyalty to Australia' and its 'democratic beliefs'. Tate later described the new oath as 'almost the personal expression of everything I've tried to achieve in public life'. Writing in 2008, Tate argued that a 'republican form of government would make the object of our loyalty crystal-clear'. Federal intervention in the Tasmanian ALP preselection process again ensured Tate's return to the Senate at the March 1993 election. However, in the aftermath of Labor's remarkable victory, Keating stated his wish to rejuvenate his ministry, asking for Tate's resignation from ministerial office. Tate, who had enjoyed power and the 'constant adrenalin flow' of ministerial life, admitted being 'angered and distressed' by Keating's request. Aged only forty-seven at the time, he believed that he still had 'much to offer', later reflecting that the 'biggest element of the transition' from politics was the absence of publicity: 'You tend to think of publicity as the measure of your political success and, of course, this is a terrible poison'. He decided that staying 'to stagnate on the backbench' would have set him upon 'the road to bitterness', and so he resigned from the Senate on 5 July 1993. Tate was rewarded for his actions with a diplomatic posting as Australia's Ambassador to the Netherlands and to the Holy See (the Vatican), serving from 1993 to 1996. Based at The Hague, he promoted Australia's interests in a case heard by the International Court of Justice in 1995, in which Portugal instituted proceedings against Australia over events in East Timor. He also closely observed the setting-up of the International Criminal Tribunal for the former Yugoslavia and, three years later, he publicly argued for Australian ratification of the Rome Statute of the International Criminal Court. In 1996 he was appointed an Officer of the Order of Australia and, later in the same year, he surprised Pope John Paul II, at their final meeting, when he told the Pope that he was leaving his post to become a priest. This entry draws throughout on an interview with Michael Tate by Gary Sturgess, 10 Sept. 2012, POHP. Tasmanian Times (Hob. ), 1 July 2003; Transcript, G. Doogue, ABC TV, 'Compass', 17 April 2011; Sunday Examiner (Launc. ), 16 Sept. 1984, p. 16; Sunday Tasmanian (Hob. ), 20 Nov. 1988, p. 7; Australian (Syd. ), 17 Dec. 1990, p. 4; Age (Melb. ), 19 Feb. 1987, p. 11; Mercury (Hob. ), 5 Aug. 1977, p. 3, 13 Jan. 1978, p. 7. Sunday Tasmanian (Hob. ), 20 Nov. 1988, p. 7; CPD, 3 Nov. 1983, pp. 2198–9, 23 Oct. 1984, p. 2206, 23 Aug. 1978, pp. 330–3, 18 May 1983, p. 552, 31 May 1983, pp. 1024–5, 28 May 1985, pp. 2623–5, 6 Dec. 1985, pp. 3167–8, 3 June 1986, pp. 3220–1, 5 Dec. 1986, p. 3517, 1 April 1992, pp. 1453–4, 23 June 1992, pp. 4393–5. Sunday Tasmanian (Hob. ), 20 Nov. 1988, p. 7; Examiner (Launc. ), 14 Nov. 1979, p. 1; CPD, 23 March 1982, pp. 1051–6, 11 June 1981, pp. 3132–5, 15 Sept. 1980, pp. 1000–3; CT, 10 Jan. 1984, p. 3, 8 Aug. 1986, p. 9; Press Release, Senator Michael Tate, 2 Feb. 1984; CPD, 11 Nov. 1985, pp. 1922–6, 19 Feb. 1980, pp. 53–8, 20 Feb. 1980, pp. 107–11. Age (Melb. ), 19 Feb. 1987, p. 4; Mercury (Hob. ), 11 Feb. 1983, p. 2, 28 May 1984, p. 8; Reverend Michael Tate, Speech to the Tasmanian Historical Research Association, Hobart, 8 March 2011; CPD, 22 April 1983, pp. 88–90, 24 Aug. 1984, pp. 371–3, 21 Feb. 1985, p. 20; Harry Evans and Rosemary Laing, (eds), Odgers' Australian Senate Practice, 13th ed., Department of the Senate, Canberra, 2012, pp. 505, 538–9; SMH, 1 Nov. 1984, p. 1; CT, 3 Sept. 1986, p. 7; CPD, 11 April 1986, pp. 1570–3. CPD, 17 Oct. 1985, pp. 1419–20; Select Committee on the Human Embryo Experimentation Bill 1985, Report, Sept. 1986; Age (Melb.) 11 Oct. 1986, p. 2; CT, 4 June 1986, p. 2, 29 May 1985, p. 22, 1 May 1988, p. 4, 3 Sept. 1986, p. 7, 6 Feb. 1987, p. 7, 17 Feb. 1987, p. 1; Examiner (Laun. ), 16 Nov. 1986, p. 1; Advocate (Burnie), 17 Nov. 1986, p. 4; WA (Perth), 17 Feb. 1987, p. 3; Bob Hawke, The Hawke Memoirs, William Heinemann Australia, Melb., 1994, pp. 418–9. Michael Tate, 'The federal fight against organised crime', Sir Samuel Griffiths Memorial Lecture, Canberra, 2 May 1989; CPD, 23 Sept. 1987, p. 565, 25 Sept. 1987, pp. 1754–8, 5 Nov. 1987, pp. 1754–8, 25 Nov. 1987, pp. 2413–15, 14 Oct. 1988, pp. 1360–6, 4 Nov. 1988, pp. 2062–8, 8 Dec. 1988, pp. 3809–10, 4 Oct. 1989, pp. 1632–4, 27 Oct. 1989, pp. 2426–8, 2 Nov. 1989, pp. 2806–7, 19 Dec. 1989, pp. 4791–3, 21 May 1990, p. 626, 23 May 1990, p. 880, 26 Nov. 1990, p. 4397, 19 Feb. 1991, pp. 812–5, 6 March 1991, pp. 1308–10; D. Chappell, 'Prevention of Violent Crime: The Work of the National Committee on Violence', paper presented to the Conference of the Australian Crime Prevention Council, Melb., 6 July 1989; 'The Justice Portfolio', Reporter, Vol. 8, No. 3, Sept. 1987; Age (Melb. ), 28 March 1989, p. 6, 14 June 1989, p. 5; CT, 20 March 1989, p. 2, 14 June 1989, p. 21; Media Release, Senator Michael Tate, 18 Aug. 1987, 5 Dec. 1988, 28 Dec. 1988, 9 Feb. 1990. CT, 10 May 1990, pp. 1–2, 12 May 1990, p. 9, 16 Nov. 1990, p. 18, 22 Jan. 1991, pp. 1–2, 14 May 1991, p. 5; Mercury (Hob.) 10 May 1990, p. 1, 14 March 1992, p. 9; CPD, 9 May 1990, pp. 99–102, 10 May 1990, pp. 244–64, 12 Nov. 1990, pp. 3939–40, 19 Dec. 1991, pp. 5093–4, 26 May 1992, pp. 2660–3; Tasmanian Times (Hob. ), 1 July 2003; Media Release, Senator Michael Tate, 13 Nov. 1990; AFR (Syd. ), 9 Aug 1991, p. 3. CPD, 7 Oct. 1992, pp. 1280–1, 29 Sept. 1993, pp. 1413–16, 1439–42; Australian (Syd. ), 8 Oct. 1992, pp. 1, 4, 17 April 2008, p. 14; CT, 24 Feb. 1992, p. 1, 7 March 1992, p. 7, 7 May 1993, p. 3; Don Watson, Recollections of a Bleeding Heart: A Portrait of Paul Keating PM, Knopf, Milson's Point, NSW, pp. 221–2; Sunday Tasmanian (Hob. ), 23 Feb. 1992, pp. 1–2; Media Release, Senator Michael Tate, 18 March 1993; Transcript, ABC TV, 'Compass ', 17 April 2011; Tasmanian Times (Hob. ), 1 July 2003. Tate, Speech to the Tasmanian Historical Research Association, Hob., 8 March 2011; Advocate (Burnie), 20 March 1993, p. 4; Mercury (Hob. ), 11 May 1993, p. 2; Tasmanian Times (Hob. ), 1 July 2003; Transcript, ABC TV, 'Compass',17 April 2011; Transcript, ABC TV, '7.30 Report', 19 May 2000; CPD, 6 Oct. 1993, pp. 1771–5.